in the oven and viola! Dinner! days. I did not have the fresh herbs, but definitely had the other elements. I decided to pull out a sheet pan and fill it up with our future dinner. head I got this week was tiny, so maybe not. 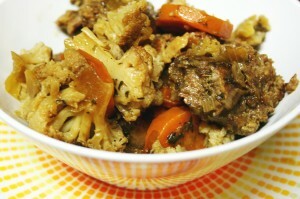 absorbed the flavors of the juices and it evolved into a great side dish. is on top and the cabbage is below. and herbs into a sauce. Set aside. of the pan, slit side up. cover the surface of all the pieces. at least 165 degrees Fahrenheit. Remove sheet from oven and let sit for five minutes before serving. We had some lovely visitors from Texas recently. While they were here we had big plans to cook a lot of stuff for them, but we ran out of meals and time. These bell peppers were still hanging out in the refrigerator after they left, so I needed to do som ething wonderful and amazing with them. It was not their fault they were usurped by a brunch buffet, grilled ribeye, bacon wrapped asparagus and pizza. I used to never like stuffed peppers. They were often overcooked, filled with flavorless rice and left me hungry. 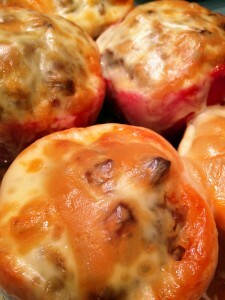 When I first made stuffed peppers for myself I decided they needed to eliminate the unsavory elements. Heh. Get it? Unsavory? Okay, I will stop. I first tried stuffing poblano peppers, which turned out great. This time I worked with the previously spurned colorful bell peppers. Bottom line, I added flavor and subtracted rice. The peppers turned out to be a lively, satisfying meal on a rainy day after much errand running. Next time the peppers will not be second or third fiddle, but instead the first choice. Yummy! Remove top of each pepper, also removing pulp and seeds from inside. Rinse, shake out excess water and place in 8 x 11 inch baking dish. Divide onions equally among the peppers by dropping them into the bottom of each. Sprinkle onions with salt. In a large bowl combine beef, sausage, egg, grated cheese, cumin, garlic, salt, black pepper and chile flakes. Squishing it all together with your hands is the best method. Firmly press the meat mixture into each pepper until it is level with the top. Bake for 45 minutes. Place a slice of cheese on top of each pepper. Return to oven and bake for an additional 20 minutes, until peppers are soft and cheese begins to brown. Remove from oven and let cool for about ten minutes. 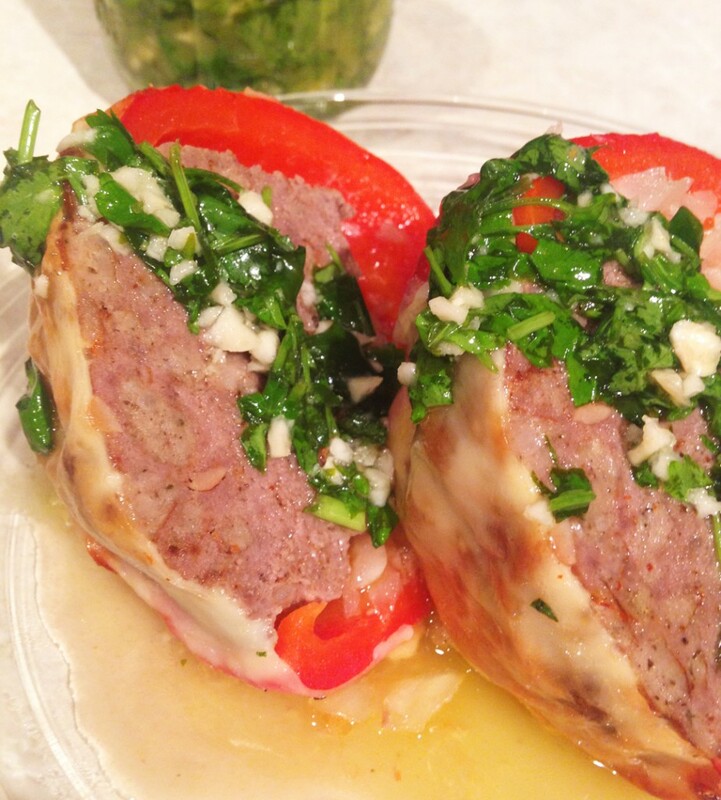 Suggest serving drizzled with chimichurri. I have mentioned in the past my long relationship with portobello mushrooms, their meatiness without being meat, and how well they work as a base for pizza and all things baked. This recipe relies on the mushrooms to utilize leftover chopped onions and sausage. Easy to put together and slide in the oven, I set them up then piddled while they were busy cooking. I was able to to shower, we made ice cream for dessert and even cleaned up the house a bit. Don’t worry. The flavor combination was nice a balanced, with the dressing flavoring the mushroom and the sausage and onion dancing well together. After dinner there was not much left to do but cuddle and read and chat with my family on our big green couch. That is the way I like spending weekday evenings after a busy day – a full stomach from a satisfying meal, and do nothing time, which dones more than nothing for us. That, or the beach, but the beach was for another day. Gently cook sausage in a frying pan over medium heat, breaking it up into bite-sized pieces, but not too small. It can be left slightly pink (it will finish cooking on the mushrooms). Preheat oven to 350 degrees. Place mushrooms cap side down on work surface, leaving the stems attached. With the back of a spoon spread dressing on the gills of the mushrooms. Place sausage pieces on the gills, surrounding the stem. Sprinkle onion on top of the sausage. Place two pieces of cheese on top of each mushroom, lining them up unevenly so most of the sausage and onion is covered. Place mushrooms on baking sheet. Place sheet in oven and bake for 45 minutes to one hour. The cheese should be melted and starting to brown. Remove from oven and let cool for five minutes. Serve plain or with guacamole. We eat a lot of burgers. A lot. They are our go to meal when we can’t think of anything else, or are running late, or are bored, or end up at a quick serve restaurant. The quick serve restaurant is always a challenge. You cannot imagine the number of blank looks I get when ordering and tell them I don’t want buns. “No, I do not want buns.” “No, no buns.” “You can use salad containers and just put the condiments, meat and cheese in it. It will work fine. I promise you.” “Do I need to go in the back and talk the food prep team on how to do it?” “No, I don’t want the combo/meal. Just the burgers. I know the meal is a better deal compared to buying separately the fries and burger and drink, but I don’t want the fries. And don’t forget, I don’t want the bun either.” What usually happens is Little B and Big D will go find the perfect table and I do the ordering. Not because Big D can’t order. He is extremely articulate. The advantage to to me ordering is my patience – I soooo beat him in that arena when it comes to dealing with ordering food and other people are involved. In contrast, he is most awesome in the patience arena when dealing with me. I tend to be passive aggressive and get stuff pent up until the straw that breaks the camel’s back, and not everyone can deal with it, but he is a magician with me. Okay, on with the dish. Since we avoid traditional buns, and I rarely make low carb buns, the variety in our burger-ness relies on combining meats and the toppings. I was longing for a Tex-Mex feast, but our current situation does not allow for expansive storing of leftovers, which rules out some more bulk preparations of the guacamole, salsa and chile con queso I usually prepare. I did mini versions of the sides, so we ate most of them and storage was not an issue (phew). Also, with my previous exploration into creative meats in burgers, I wanted to do something a little different. Here are my results, which gave me the Tex Mex element, while also giving variety to our burgers with a spicy flair. It may be hard to find good jalapenos in Alaska, but when I do, they are pretty potent. Between the pepper and the ancho chile the burgers definitely left a slow burn in my mouth, and on my lips, and under my fingernails felt the heat to. I was also reminded of those little webbed parts between my fingers that have dry skin but I don’t realize it until I chop up a jalapeno. Ouch but yum! Prepare all condiments in advance. I did 1/3 batches and they were enough for these burgers, but do full batches if you have the fridge space – they are great the day after! For the burgers combine the eggs, cilantro, garlic, chile powder, salt and cumin. Whisk together until eggs are scrambled. In a large bowl smush together beef and sausage until there are no recognizable chunks of sausage. Add egg mixture and smush some more until eggs, herbs and spices are well combined. Form meat mixture into six or eight large patties. In a large frying pan over medium high heat sear one side of the burgers, about five minutes. Flip burgers and sear other side. Reduce heat by half, cover burgers and cook until done, about eight minutes. 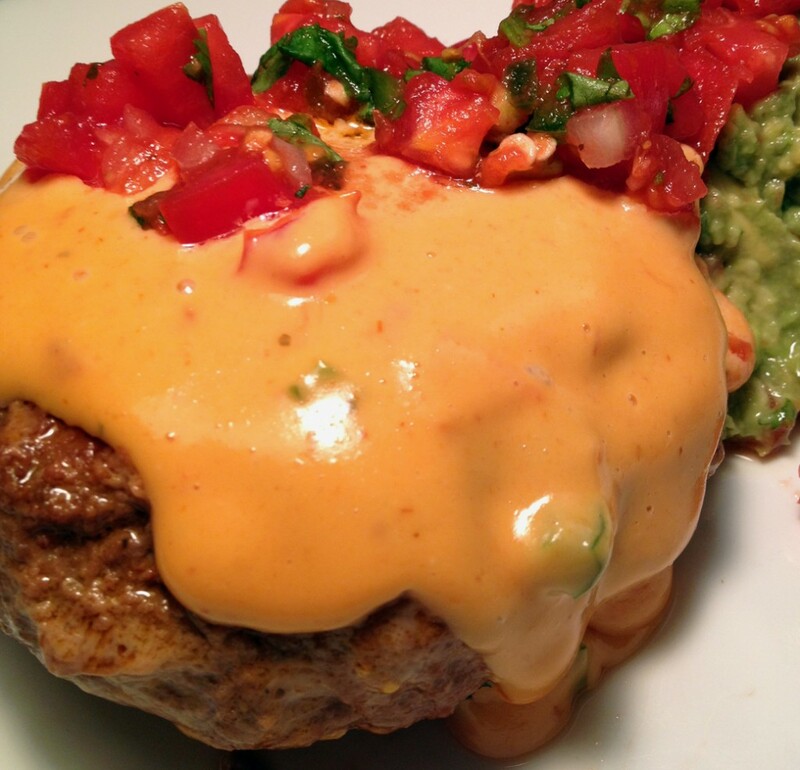 When done cooking immediately place a burger on a serving plate and top with queso and guacamole. Sprinkle with salsa and serve. If you have leftover burgers I recommend storing them separate from the condiments. I adore the name of this dish. And oh my flippin’ floopie, it is rich and delish! It reminds me of a chilly, rainy day I spent in Dublin many years ago, popping into a pub to warm up a bit with some food and drink. I did not have a coddle, but the feeling was the same. It totally has a comfort food vibe, and is considered such in Ireland. I thought of it with St. Patrick’s Day coming up and my Irish-ness starting to raise it’s head here in my blog. It is called a coddle because of the slow simmering manner of cooking the dish. Dublin, of course, comes from the popularity of the dish in the Dublin area. I read one place once that the convenience of slow cooking the one-dish meal and the ease of keeping it warm in the oven has a logical basis – it allowed for a warm meal to be ready for the man of the house when he came home late from the pub, after the rest of the family was already in bed. Heh. 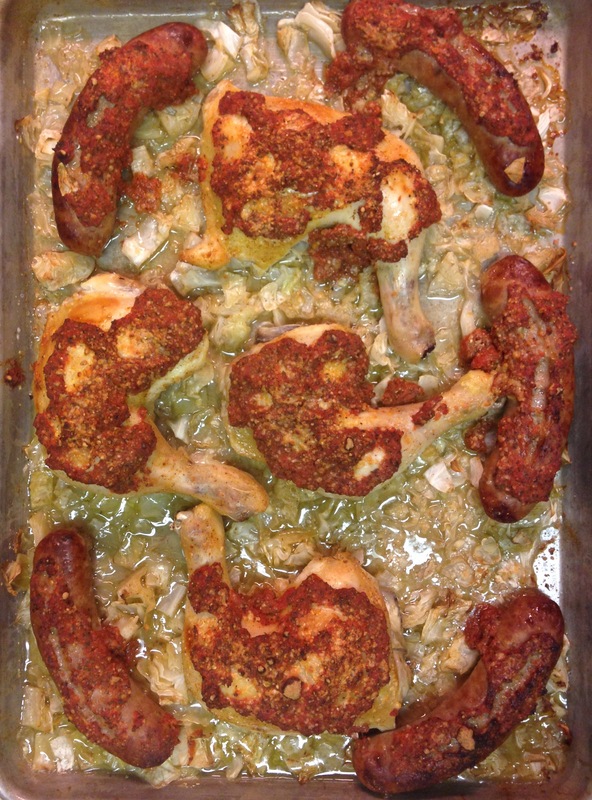 From my experience there are almost as many variations of this dish as there are mothers and grandmothers. Just like in the US there are delicious recipe variations for meatloaf, chicken soup and apple pie, each cook makes it their own way. I probably committed some form of blasphemy by excluding potatoes from my version of this dish, but we are stubborn about our use of cauliflower as a potato substitute in our diet, so I happily blasphemed. The results were like a beef stew. I know, I know, there is no beef in the recipe. It is just a bunch of pig. That is what I thought! I think the beer mixes with all the other juices and just makes a darned rich broth that is reminiscent of beef broth. Sooooo good! A layer of thinly sliced potatoes as the top layer is the more traditional route, so I included it as an option in the recipe. I thought the quantities would serve four, but we did not have any sides, just a big bowl of coddle. Since there were so many veggies and protein in the coddle it ended up being healthy servings for two very hungry people. If you are not serving sides with the coddle I would recommend doubling the recipe for a party of more than three. Cut bacon into 1-inch pieces. In a large frying pan cook the bacon over medium heat until browned. Transfer cooked bacon to Dutch oven. In bacon grease over medium high heat add sausages and cook until browned, but stop before they are completely cooked through. Cut the sausages into one-inch pieces and transfer them to the Dutch oven. In what is left of the bacon grease add the butter. When the butter is melted add the onion and garlic. Saute until onions are softened but not browned. Transfer onion and garlic to Dutch oven. You are now done with the frying pan. Salt and pepper the stuff in the Dutch oven to your liking, then pour in the water. Slice the carrot into coins, no more than ¼ inch thick. Chop cauliflower into bite-sized floret pieces, or peel and slice potatoes, no more than ¼ inch thick. Add to the Dutch oven a layer of carrot, followed by a layer of cauliflower. You may not need the whole head of cauliflower, but there should be an even layer of it over the top of everything else. If using potatoes make an even layer of slices on top, overlapping them so the other ingredients are substantially covered. Sprinkle the parsley and thyme on top of the cauliflower/potatoes, followed by salt and pepper to your liking. Add the beer or cider. The liquid in the Dutch oven should come up to about the middle of the pot and not totally submerge all the ingredients. Cover the Dutch oven with a tight fitting lid or two layers of foil. Place in 400 degree preheated oven and cook for 45 minutes, then turn heat down to 325 degrees and cook for another 1 to 1 ½ hours, until the cauliflower/potato layer is soft and ready to eat. Turn off the oven and leave the coddle inside it until time to serve. It will stay hot for quite a while. Things are pretty exciting around here right now. Not only is Grandma Jo in town for a visit, but Big D’s newly published book is selling like crazy! Every time I read it I have to make sure I allow enough time to sit and keep reading. It is hard to find a place in the story to stop, set the book down and not wonder what is going to happen next, even when I am trying to concentrate on something else. The book is called Shiver on the Sky, and is available as an e-book on Amazon. We are enjoying the good reviews and watching the sales numbers rise. Take a few minutes to check it out – there is a short, discount promotional period right now, so check it out and let us know what you think! To celebrate the successful launch of the book we had a pizza feast the other night. We don’t do delivery – nobody I know of delivers wheat free pizza – we do our own thing. Even before we started avoiding wheat we did not do delivery much, but you can read about one of those adventures here and yet another, gluten free adventure here. The pizza we make is always loaded with a lot of garlic and a whole pile of toppings. The important part is the awesome crust, which I originally found here, from This Chick Cooks, but have since tweaked. It holds the toppings without getting soggy, and there is no doughy crust getting in the way of the garlic. Did I mention we use a lot of garlic? Oh, and we use a bunch of garlic, which is not mandatory, but we like a lot of garlic on our pizza. 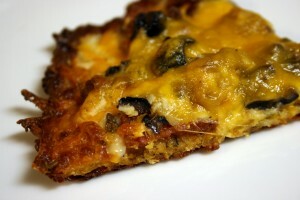 Garlic in the crust, garlic cooked with the mushrooms and garlic sprinkled between the layers of topping. And a last sprinkle of garlic on the top layer of cheese. Any topping combination you like will work on top of the crust, especially garlic. In a medium saute pan over medium heat add the olive oil. When the oil is hot add the garlic and cook until it softens. Add the sausage, breaking it up into bite sized pieces. When the sausage is half cooked add the mushrooms and toss the whole mess around until the sausage is done and the mushrooms are at least heated through. Preheat oven to 425F, then prepare the crust. In a medium bowl combine the dry ingredients with the cheese. Add the eggs and stir until combined. It will be a bit sticky and not look at all like pizza dough. That is okay. Cover a large cookie sheet with parchment paper. Spread the dough on the paper, making a very thin layer. The best way to spread it is to press down on it with your fingers – it helps to have a little bit of oil on your fingers to reduce the stickiness. It won’t spread out to all the edges, but it will cover most of the pan. The layer should be no more than 1/8 inch thick. Place pan in oven and cook just until it puffs up and the edges and top begin to brown, about seven minutes. Reduce the oven temperature to 400F. Remove the crust from the oven and begin piling on the toppings. We usually start with a thin layer of ranch dressing, followed by some cheddar cheese, sausage/mushroom/garlic, mozzarella cheese, then pepperoni and olives, followed by a mix of cheddar, mozzarella and last but not least Parmesan. If you like your pizza herby, then do what we do and sprinkle some parsley, basil and garlic between the layers of toppings. Bake the pizza for 10-15 minutes, until the cheese is melted and starting to turn brown on the edges. Remove from the oven and let cool for at least five minutes before cutting. Preheat oven to 350F. In small sauce pan combine the diced tomatoes, paste, oregano, parsley, onion powder, salt and Splenda or sugar. Bring to a boil over medium heat, turn down flame and simmer for about 15 minutes, then remove from flame and let sit. While it is cooking prepare the rest of the dish. In a medium bowl mix the ricotta cheese, spinach and nutmeg and set aside – trust me – it sounds odd, but the nutmeg enhances the ricotta flavor. Slice ends off of zucchini. With a vegetable peeler peel off long strips of zucchini. If you don’t have a peeler, instead make zucchini coins as thin as you can with a knife. 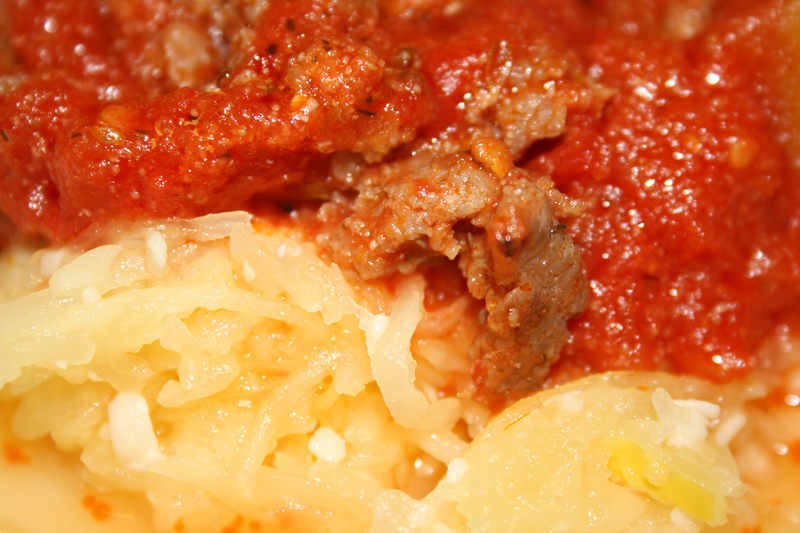 To build the lasagna begin with a thin layer of sauce in the bottom of a 9×13 inch baking dish. Add a layer of zucchini strips/coins overlapping generously to make a solid layer, followed by the ricotta mixture, sauce, mushrooms, sausage and 1 cup of mozzarella. Repeat the layers again. Top with a third layer of zucchini and the last of the mozzarella. Bake lasagna until heated through and cheese on top begins to brown, about 45 minutes. Remove from oven and let cool for about ten minutes, allowing the lasagna to set. The nostalgia is dripping from my entries lately. Never fear, it continues here. Starting in high school my friends and I would go to the Texas Renaissance Festival every autumn. It ran October through November on weekends. The trip was a big deal for us because it did not include parents. Since we could not get permission (or collect the funds) for an overnight trip, our adventure was a freakishly long marathon. A one way trip from San Antonio to the festival north of Houston was at least four hours. The round trip, plus time at the festival (and staying up late the night before leaving) equaled a twenty hour day. It was a lot of fun and a lot of gas station stops. We returned home tired and smelly and happy, with bags smelling of incense and full of Christmas presents. 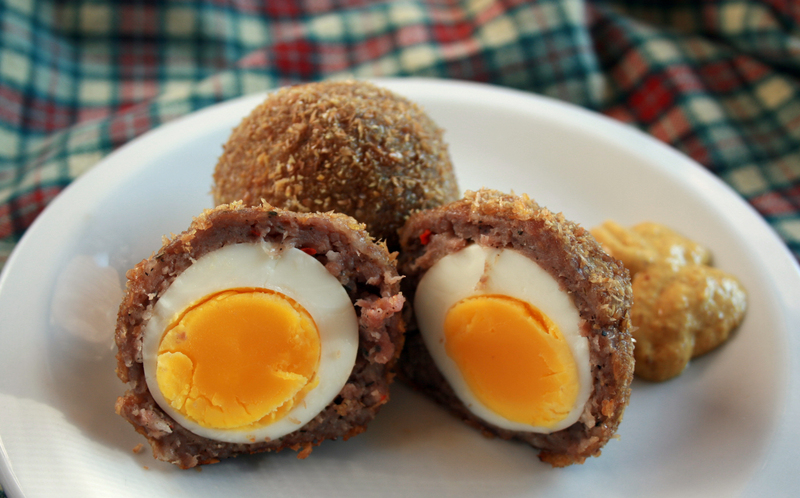 Our first stop in the festival grounds was always along the right edge of the outer ring, to eat our first of many treats – Scotch eggs. They were great sources of protein after the doughnuts we grabbed in Flatonia and the empty calories of candy and chips. 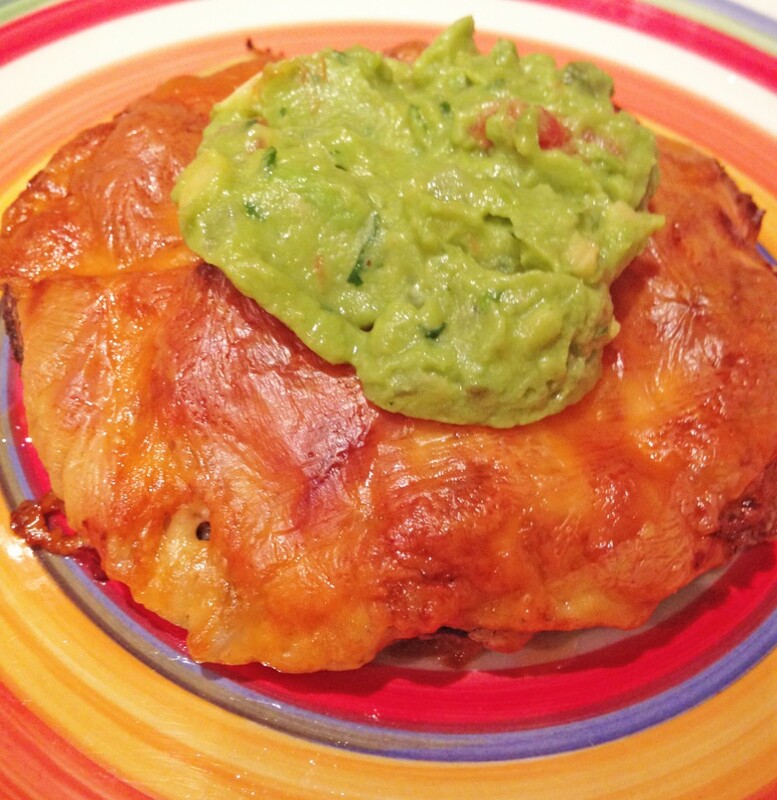 Here is a low carb version that reminds me of the festival snack. We will be going to the Maryland Renaissance Festival in August, and I am curious to see if they have them. On this fine Sunday morning while the summer sun shone brightly through the kitchen window I made a batch that tasted so very good, and introduced Little B to the dish – she inhaled her egg and ate some of Big D’s and mine. After the feast was over we lamented the fact we did not include some theme music. Consumption of the next batch will definitely include the tunes of Tartanic! I took guidance for this recipe from here. Have a happy day, and always return to happy thoughts and places whenever you can. Preheat the oven to 350 degrees. Line a baking sheet with aluminum foil. Combine the flaxseed meal and salt together in a bowl. In another bowl whisk together the two raw eggs. Divide the sausage into eight piles. Using your hands, press the sausage into a patty in the palm of your hand. Place a hard boiled egg in the middle of the patty and and mold the sausage around it until it is completely and evenly covered. Roll each sausage covered egg in the raw egg, then each in the flaxseed meal to coat it. Repeat with the remaining eggs, then roll them all once more in the meal until it is gone. Place the eggs on the foil-lined baking sheet, at least two inches apart. Bake the eggs until the outside is browned and the sausage is cooked through, about 25 to 30 minutes. Remove from the oven and let the eggs rest for 5 minutes. Slice in half and serve with mustard. I don’t mean to deceive you with this post. I did not make the sausage, although we have sausage making gear, and I did not make the sauerkraut, although I have made it in the past. I also did not make the cheese, which really brought the dish together. I am really posting about how I combined stuff I never thought of combining and was really surprised about how well it worked together. 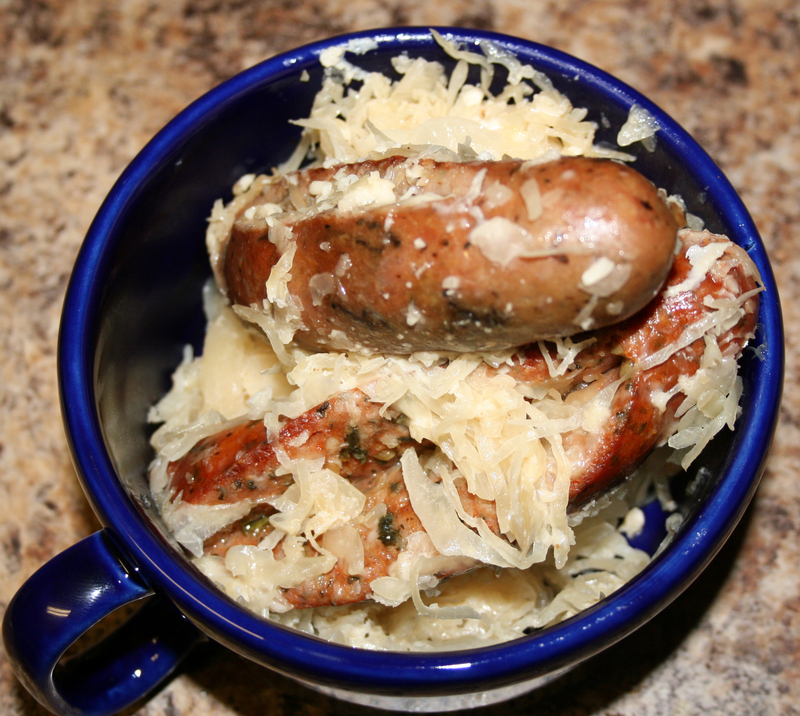 I have always loved the combination of sausage and sauerkraut, but I just never did much about adding cheese to it. We had some nice fresh Parmesan in the fridge, so after sauteing the sausage and adding the kraut I sprinkled some Parmesan into the mix. Maybe it was the lovely Portabello Mushroom sausages, or the spicy Habanero and Green Chile sausages, but the cheese just seemed to make the whole dish sing. I cannot guarantee that if you use the powdery Parmesan from a plastic shake jar it will have the same zing, but next time you find some Parmesan waiting to be used, toss it in with some sausage and sauerkraut. You may be as surprised as I was with the result. Make a 2” slit in one side of each sausage. Saute over medium high heat until browned on most sides. Add sauerkraut and toss until brown stuff on the bottom of the pan is blended with it and the sauerkraut is hot. Sprinkle cheese over it all and toss until melted. Serve immediately. This is a down and dirty delicious weekday dinner. It uses some basic kitchen pantry ingredients I have on hand pretty much all the time. The first time I had spaghetti squash I did not like it. I think I was about ten and very much looking forward to pasta. It was crunchier and the flavor is very much squashy – of course I was comparing it with soft cooked pasta, so of course it would be different. As I got older I began to appreciate it more, and now love it! We used to try and boil it, which took forever, but then we discovered the microwave method, introduced to us by my mother in law. Of course the sauce would benefit from simmering for five hours, but it was delicious with just 20 or so minutes. I will be doing more quick dishes in the future, and am inspired by my friend Stacie’s blog. Besides her awesome food ideas she also makes wonderful lotion. In a medium sauce pan over medium heat combine tomatoes, garlic, oregano, salt and sugar. Cover and cook until bubbly. While tomatoes are bubbling away add sausage to a frying pan, break up the meat and cook until browned and well done. Drain sausage and add it to the tomato sauce. Simmer for 10-15 minutes until the flavors have time to mix. Cut spaghetti squash in half lengthwise. Scoop out seeds and stringy membrane. In shallow baking or pie dish add about ¼ inch of water. Add half of the squash, cut side down. Cover with cling wrap and place in microwave. Cook on high for about eight minutes, until squash is soft. With a fork scrape out inside of squash, pulling stringy ‘spaghetti’ out of the shell. Place squash in bowl with butter and cheese*. Stir together and let cheese and butter melt. Serve sauce on a bed of squash. *Sometimes the squash soaks up some water. If you want to avoid the possibility of having a watery plate when serving, you can add a step before mixing the squash with butter and cheese – lay out a couple of paper towels and spread squash out to dry a bit. After doing this you may need to reheat the squash to make sure the butter and cheese melts.